An attendant stops me as I enter the gate, mistaking me for a tourist. There is no sightseeing at Tsukiji-Honganji temple this morning. Hundreds of people solemnly black-clad under umbrellas. A funeral in the rain. The sun’s burial? The crowd have gathered to mourn Nagisa Oshima. Cavernous yet somehow womb-like, the stone temple’s main hall offers sanctuary from the downpour. Large screens on either side of the altar show fragments from Oshima’s entire filmography, in chronological order. “They finally made an English-subtitled print of Ninja Bugeicho,” Hiromi Aihara, scout for countless film festivals, leans over to inform me as Sanpei Shirato’s artwork appears on the screens. It will have its unveiling at MoMA’s Art Theatre Guild retrospective mere days after the funeral. Through the air heavy with incense, Ryuichi Sakamoto’s theme for Merry Christmas, Mr. Lawrence resounds, again and again. A timeless piece of music. You can listen to it a hundred times in a row and not grow tired of it. 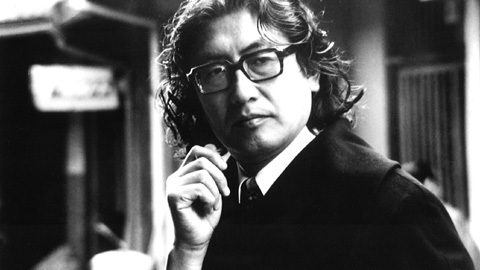 From his portrait above the altar, swathed in a fragrant mist, Nagisa Oshima observes the proceedings, sternly yet benignly, but above all larger than life. The crowd is of a certain age, as funeral crowds tend to be. Aside from the director’s grandchildren, the youngest person in the room is Ryuhei Matsuda, star of Gohatto, who will rise to read a message from Tatsuya Fuji, star of In the Realm of the Senses, who proclaims Oshima his “hero”. Masahiro Shinoda’s forcefully delivered reminiscence of their early days at Shochiku falters at the last hurdle; overcome with emotion, he stumbles all the more poignantly through the final sentence of his monologue. Ryuichi Sakamoto ad libs his thoughts and echoes Tatsuya Fuji’s words: Nagisa Oshima, hero of (at least) a generation. Yoichi Sai, head of the Director’s Guild of Japan, delivers a rousing, life-affirming speech by heart, making clear why Oshima chose this fellow filmmaker to play the head of the Shinsengumi militia in Gohatto. "My husband is drinking with Koji Wakamatsu right now," says Akiko Oshima. The unmistakable sound of an 8mm camera rattles from somewhere behind me. Someone attempting to leave a will on film. One of the monks has a coughing fit while chanting the sutras. As I watch the procession of mourners pass the altar, I realise that I am the only foreigner there. The attendant’s mistake too was human.